This will be my sixth Christmas since my husband Claude’s suicide. Over time my heartache has lessened considerably. But I will always feel the pain of his absence in the recesses of my heart. With each year it has become abundantly clear that making a conscious choice to take care of myself around the holidays is a must and a non-negotiable for me. The holidays can be a major trigger for unresolved emotions and remembering those who we have lost. Noticing the black hole in the wake of their absence seems unavoidable this time of year. Our society is practically commanding us to feel “Jolly and Bright”. There isn’t a lot of recognition for those of us who may be grieving a loss. Let’s face it, if we are grieving, we are anything but “Jolly and Bright”. Chances are we are feeling hopelessly trapped in darkness and despair with no end in sight. So what can we do to support ourselves through this season and beyond? I invite you to devote some time each day to recognize all that we are embracing as we walk with grief. It is an all-encompassing experience that can rattle us to our core. We must honor this process and all that it entails. To this end I have found some things to be particularly helpful with my own grief that I will share with you. As a former massage therapist, energy healer and trauma survivor I tend to focus on self-care practices that will feel nurturing and quieting to our nervous system. But there are innumerable ways to care for ourselves during the holidays and while we are grieving. With holiday parties and gatherings, you may feel some pressure to be present in ways that you simply don’t feel up to. However, you get to choose what feels right for you. If the thought of being with people appeals to you then go for it. If you would rather have some quiet time alone, then allow yourself that choice. Please remember, there will always be those who have an opinion on what they think you need. Ultimately though in the end you know what’s best for you. Trust that and do what you are feeling called to. If you decide to carve out some restful and reflective time you may want to incorporate some of these things that I have outlined below. ~One of my all-time favorites is taking pleasure in the comfort of a luxurious warm bath with candles, soothing music and essential oils to lift our spirits. This gives us an opportunity to decompress and find some meditative time which is powerfully healing. ~You could go for a spa treatment, healing or bodywork session maybe even include a dear friend and make a day of it with lunch or dinner included. It’s so important to pamper yourself, you deserve this! ~You could spend some time out in nature, in a favorite park or outdoor space. Nature is my number one go-to for finding balance and healing. I go for daily walks with my beloved dog Lyra. There is nothing quite like being on the earth to help you feel grounded and gain a new perspective on your life circumstance. Mother earth in all her glory is there waiting for us. Hear her call and take advantage of her wondrous gifts. ~You could surround yourself in a cozy blanket and sit by a fire with a warm cup of tea or cocoa. The simple act of watching the flames alone can feel calming and deeply reflective. Reading an inspirational book or inspirational quotes can be helpful as well, fireside. ~Engaging in some form of physical activity is an important way to not only move your body but move your mind. Without movement we can experience stagnation. Movement can have a balancing effect on our body, mind and spirit. You get to choose what works best for you. It could be yoga, running, walking, etc. ~Allow your emotions to come to the surface in an intentional and conscious way. Give yourself time to cry, scream, yell…whatever you need to be present with and release in the moment. You might want to give yourself some time for writing in your journal or maybe a letter to your lost loved one. Or maybe even a letter of encouragement to yourself. ~Reach out for support from a trusted friend, relative or councilor. This time of year can be brutal and you don’t need to do this alone. People may not know how to support you. The more specific you can be the more likely you will get what you need. ~When I am feeling overwhelmed with sadness I like to put my hand over my heart. This can help open our heart center and our breath. While we are grieving it can sometimes feel difficult to breath fully. This can help with that by bringing our awareness and our intention to our heart space and into the present moment. Equally important is to bring awareness to our ability to love ourselves in these moments of grief. So imagine love steaming from your hand into your heart and give yourself a big hug filled with all the love the Universe has to offer! The importance of gratitude can’t be overstated even while we are grieving. Being in a place of gratitude for what remains present in our lives can feel like a soothing balm if we allow its magic to embrace us. Through a mystical partnership our light remains shining despite the darkness, we can’t have one without the other. Our souls are shining with their infinite illumination and wisdom. It’s up to us to remember that even when our lives feel insurmountable we are radiant divine beings. Finding sanctuary within this knowledge can usher us into a new day. Along these lines, there is a practice where it is typically suggested to light a candle by a favorite photo of our dear departed ones. Although I do love that idea and it is something that I have personally found comforting, I’d like to suggest an alternate version of that tradition. We could light a candle to honor ourselves and that eternal light that remains within the shadows of our grief. We could honor all that we have lost and all that we are going through by affirming that we do have the strength and resilience to get through this. Our souls are with us every step of the way guiding us along this journey. We are never alone despite how it may appear or how we may feel in our times of deep sorrow. This simple yet powerful daily ritual of lighting a candle can serve to remind us of this. I hope you have found some ideas here that you find beneficial with tending to your grief. They won’t take away your pain and suffering but they may create a respite even if it’s only for a moment from the heaviness in your heart during this holiday season. Love your practical and thoughtful advice, Kara. All the remedies to help console grief are so effective! For me it is sometimes just an effort to initiate the motion of choosing any of these suggestions, especially getting myself outside into nature. Once I’m there I am so much happier but because I live in a big city it is often a huge effort to get out and be surrounded by the natural glory and quietness. Thank You for your wonderful blog posts. They are very supportive, especially this time of year when I long for the family members I have lost. Really great suggestions. It helped to read this and be reminded that we are not alone in our grief and that it will get better. Blessings and Merry Christmas. Prayers that next year will be the best year ever. Wonderful advice and suggestions, Remembering the LOVE and Happiness That I received and the good times we had together while they were with me helps me with my grief and makes the Holidays bearable for me. What a beautiful and generous thing you have done to share what you’ve learned with others in need of this. Peace and blessings. Tenderly appreciating, “When I am feeling overwhelmed with sadness I like to put my hand over my heart. This can help open our heart center and our breath. 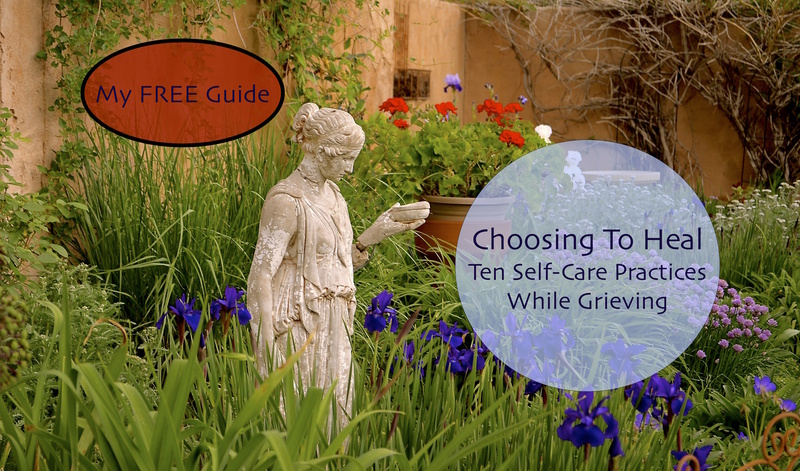 While we are grieving it can sometimes feel difficult to breathe fully.” Thank you for your many self-care suggestions! Wishing you a beautiful holiday season, with all the most nourishing things your soul desires! This is such a helpful list. Thank you!